This customer called us to help them address the challenge of having every package of their product contain what the label specifies as they are tested by regulatory authorities for accuracy. They also were concerned with the generation of fines due to the product working against itself and with their long mix times. 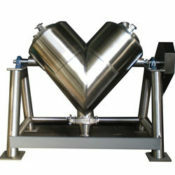 The customer currently utilizes a V-cone style of tumbling blender with a mix time in excess of 30 minutes. The units take up a lot of floor space and swing around their axis which means operators must leave the area while the mixers are running. They were examining the feasibility of changing mixing technologies while maintaining product integrity (minimal to no fines generation) and increase safety. We had met previously at a trade show where we demonstrated our machine and it’s ability to mix minor ingredients homogeneously within 30 seconds. We were invited to demonstrate at one of their production facilities with their products in our mobile demonstration mixer. They selected our single rotor mixers because the residency time of the product would be 90% shorter resulting in less product degradation from rubbing against itself and increased safety on the mixing platform. To substantiate our accuracy and fines claims, the customer produced twenty batches of product over two days of testing while taking approximately 300 samples. They reported all of the samples were within 0.5-0.6% standard deviation. We custom designed a system with two mixers, a mezzanine, bulk bag unloading, load cell package and controls. 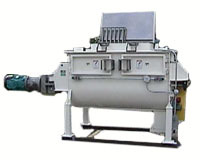 We are producing the same amount of product in one single rotor mixer as they were previously in three of their V-cone blenders. The customer anticipates less than 6 months return on their investment.